Ashery read an article in a local Dublin newspaper about Dr Mary Toomey, an international clematis expert, who spoke about her daughter leaving Dublin due to racism. Dr Toomey herself had emigrated to Dublin from Sri Lanka in the 1960′s and had never experienced racism until recent years. Ashery made contact with Dr Toomey and asked her to write a letter to her absent daughter, during the meeting Toomey said that she does not go to the city centre any longer due to new racism fed by recent waves of immigration to Ireland. The installation included a video of the journey from Toomey’s house to the city centre played in reverse, a clematis flower and the 3-page letter that Dr Toomey wrote to her daughter following Ashery’s request. 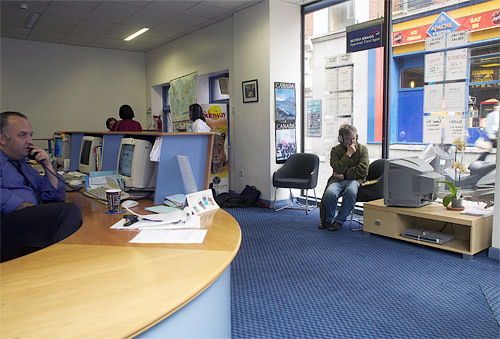 The installation was based at Apex Travel Agency in Dublin city centre, as part of Project Art Centre’s No Respect, curated by Allan Phelan and Jane Speller.